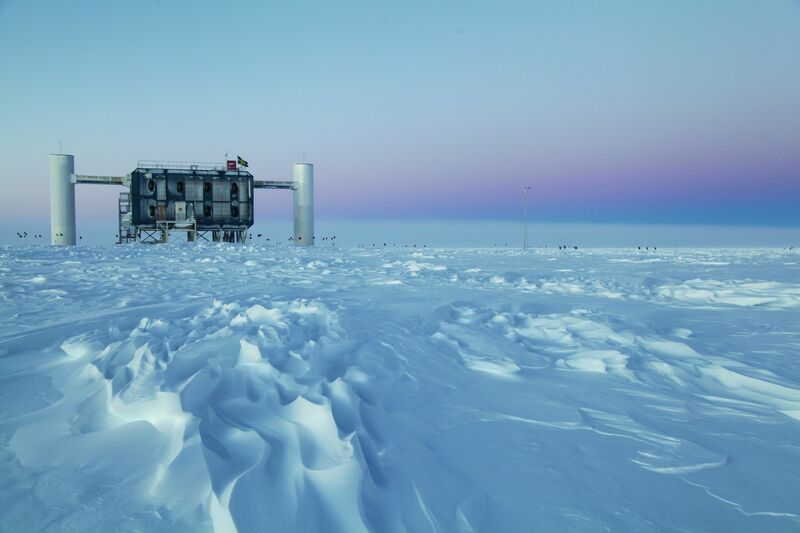 The IceCube Neutrino Observatory at the South Pole was the first to discover ultrahigh-energy neutrinos which most likely were the result of cosmic acceleration in outer space. "After more than a decade of intense searching, we can now announce that we have found neutrinos that were very probably generated in the vast expanses of outer space", reported Professor Lutz Köpke of Johannes Gutenberg University Mainz (JGU). Neutrinos are electrically neutral particles with tiny mass. High-energy neutrinos may be generated in the proximity of black holes and are subsequently accelerated to acquire their extraordinary energies. They can then travel through space almost completely unhindered. On the downside, they are very difficult to detect. The IceCube experiment has now found 28 neutrinos with energy greater than 50 tera-electron volts (TeV) all of which landed in the Antarctic ice between May 2010 and May 2012. "This discovery was one of the key objectives of the IceCube experiment. It is fantastic that we have now reached this milestone, and in a way it is a relief as well," said Köpke, who has been searching for astrophysical neutrinos for more than 13 years and served as an internal reviewer as the final analysis was scrutinized. The IceCube Neutrino Observatory is composed of 5,160 optical sensors placed in the Antarctic ice. Together they cover one cubic kilometer of clear South Polar ice. The high-precision optical sensors can detect weak flashes of blue light, also known as Cherenkov radiation, which is generated if neutrinos react near a detector and produce charged particles. The detector was completed in late 2010 and provides data around the clock. It is currently the largest facility designed to search for neutrinos from outer space. Even though a few neutrinos were discovered in 1987 after the explosion of a supernova in the Large Magellanic Cloud, their energy was about a million times less than the particles that were justdiscovered. "Some of the neutrinos we have now detected have a thousand times more energy than neutrinos created in particle accelerators on earth," explained Köpke. "Only a third of the 28 high-energy neutrinos could have been generated by cosmic radiation in the Earth's atmosphere." Unlike light, neutrinos can penetrate space dust unhindered and can even penetrate our planet Earth. In doing so, neutrinos provide information about their far-away sources. 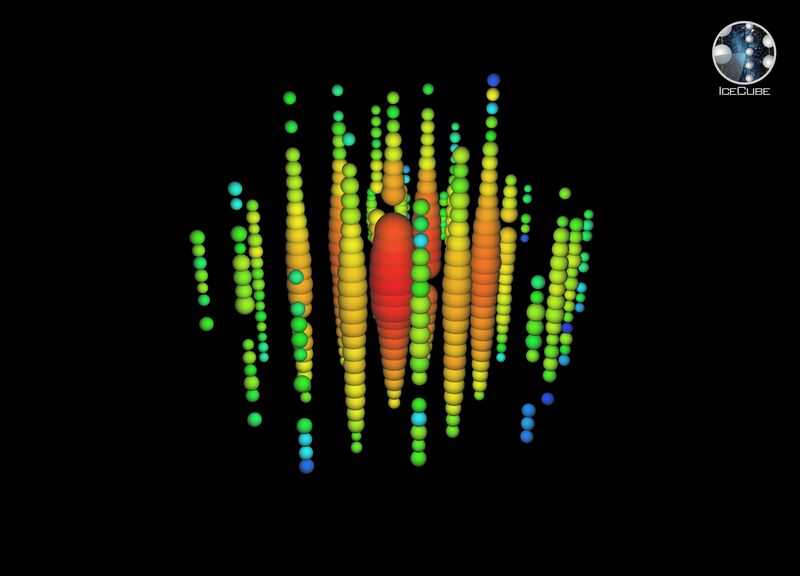 The highest energy neutrinos can be detected with IceCube, regardless of the direction they came from. "Over the next ten years we will continue to gather data which will tell us more about the origin of cosmic radiation and the unique properties of the neutrinos," said Köpke. Billions of neutrinos penetrate every square centimeter of the Earth. Most are generated in the sun or in the Earth's atmosphere, which is constantly being bombarded with cosmic radiation. Neutrinos from further afield inside or outside of our galaxy are much rarer. The existence of such neutrinos and the process that leads to their creation in the proximity of supernovas, black holes, pulsars, active galaxies, or other extreme extra-galactic phenomena have been discussed in many scientific papers. 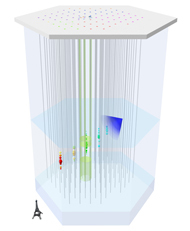 The IceCube Observatory was specifically developed to examine the frequency and type of high-energy neutrinos as well as to gain an understanding of their origins. The findings with a significance greater than four standard deviations now published in Science illustrate that the neutrinos observed have properties that clearly indicate an origin in cosmic accelerators. “The decisive analysis was carried out by a group of postdoctoral researchers and doctoral candidates at the University of Wisconsin in Madison, Wisconsin, USA, two of whom were German. Work is now being done to improve the precision of the observations and to understand what the signal means and where it comes from," explained Köpke. The IceCube Neutrino Observatory at the geographic South Pole was completed in December 2010 after seven years of construction, on time and within budget. The American National Science Foundation (NSF) financed the instrumentation and the German Federal Ministry of Education and Research (BMBF) provided sizable funding for the experiment and the scientific personnel needed to conduct it. The project includes 250 physicists from the US, Germany, Sweden, Belgium, Switzerland, Japan, Canada, New Zealand, Australia, the United Kingdom, and Korea. Professor Lutz Köpke's work group at Mainz University is part of the "Precision Physics, Fundamental Interactions and Structure of Matter" (PRISMA) Cluster of Excellence. View over the ice at the geographic South Pole to the above-ground measuring station for the IceCube experiment. The data from the photo sensors embedded in the ice are extracted and analyzed in computer farms. The picture comes from the dusk phase during the transition from the Antarctic winter (sun below the horizon) to the Antarctic summer (sun above the horizon). Artistic rendering of the IceCube detector covering one cubic kilometer. Eighty six 60-centimeter wide holes were melted into the snow surface where sensors were placed at depths of 1,450 to 2,450 meters and then frozen in place. The blue cone symbolizes Cherenkov light radiation along a particle trail. The size of the colored cone indicates how much light the sensor has registered, the rainbow colors indicate the time (earlier arrival: red, later arrival: blue). 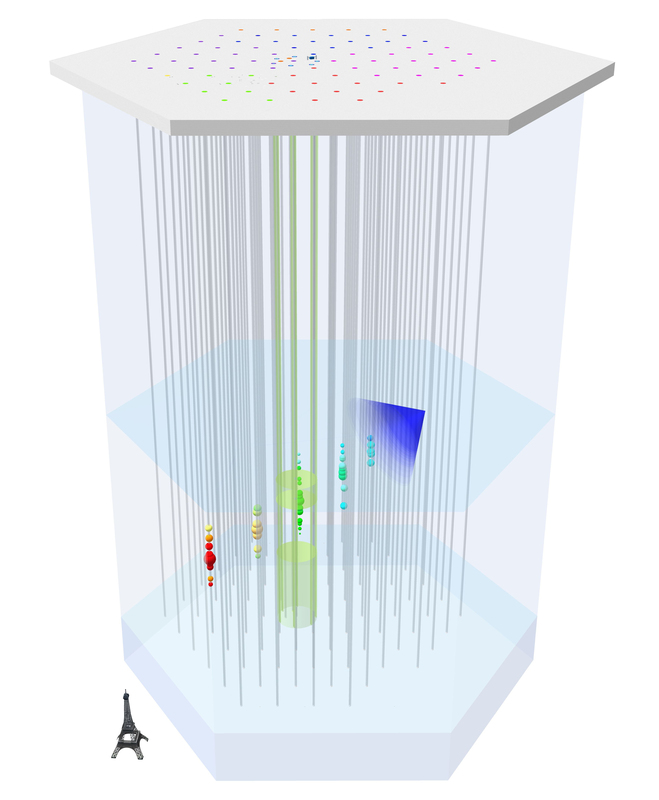 Graphic presentation of the reaction of an extremely high-energy neutrino in the IceCube Detector. The size of the colored cone indicates how much light the sensor has registered, the rainbow colors indicate the time.